The Annual Open Enrollment Period is the one time of the year when eligible customers can start new coverage or make changes to existing coverage. The Medicare Annual Open Enrollment Period and the Health Insurance Annual Open Enrollment Period have different dates and serve different groups of eligible customers. The 2018 Health Insurance Annual Open Enrollment Period under the Affordable Care Act will begin on November 1st, 2017 and last until December 15th, 2017 for a plan that will take effect on January 1st, 2018. These dates are different than prior years and the time period is much shorter. Any new enrollment or change to an existing health plan must be done between these dates unless one has experienced a Qualifying Life Event which could allow for changes outside this window. If an Individual Health Insurance plan is not required to follow these enrollment guidelines, the plan is likely not compliant with the Affordable Care Act regulations. During the Open Enrollment Period, applications and changes to plans can be made through numerous different avenues. For this reason, it’s always a good idea to contact an agent for guidance on the easiest ways to enroll or make changes to your health plan. You can speak with one of our qualified representatives for more information or assistance enrolling in a plan. Call our toll free number today 888-765-5400. The 2018 Medicare Annual Open Enrollment Period will begin on Oct 15th, 2017 and last until December 7th, 2017 for a plan that will take effect on January 1st, 2018. 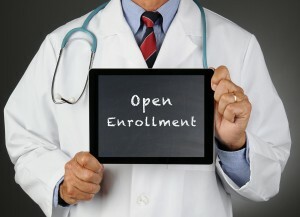 This Enrollment Period is set up for Medicare Advantage Plans and Part D Prescription Drug Plans. Both plans are offered through private insurance companies like Blue Cross Blue Shield of NC. Medicare also has other Enrollment Periods for times like a 65th birthday or Qualifying Events, which may also enable customers to enroll in Medicare Plans. Medicare eligible customers are typically over the age of 65 or under 65 with certain disabilities. If a person is enrolled in Medicare, they would not also be eligible for an Individual Health Insurance plan.